Interstate 140 is both the Pellissippi Parkway and Tennessee State Route 162. The suburban freeway angles southeast from SR 162 and I-40/75, west of Knoxville, to a bridge across the Tennessee River and SR 333 (Topside Road). The interstate designation ends at U.S. 129, while the SR 162 freeway continues southward to SR 33 near Alcoa. Interstate 140 was approved by the AASHTO Special Committee on Route Numbering on June 13, 1992. The first portion of the freeway finished was a 6.6-mile segment including the Fort Loudon Lake bridge. Traveling north from U.S. 129 (Alcoa Highway) to Northside Drive, the section was completed December 4, 1992.4 The bridge and a stretch of freeway south to Wrights Ferry Road was completed in August 1990 but not opened to traffic. The second section of I-140 extended northward four miles to Kingston Pike (U.S. 11 & 70) on October 6, 1993.7. 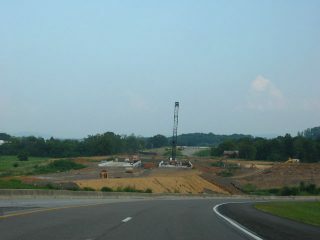 Construction for Pellissippi Parkway (SR 162) south from Cusick Road. Photo taken 08/22/03. Approval for the Pellissippi Parkway Draft Environmental Impact Statement (DEIS) followed on April 14, 2010 and the Final EIS (FEIS) on September 10, 2015. Alternate A was endorsed by the Maryville City Council on October 4, 2011 and the Alcoa City Commission on October 11, 2011. The Blount County Commission voted to send a recommendation for Alternate A on October 11 as well.10 The record of decision (ROD) for the project was signed by FHWA on August 31, 2017. A full cloverleaf interchange (Exits 11B/A) joins the east end of Interstate 140 with U.S. 129 on the north side of Alcoa. Photo taken by Chris Patriarca (03/22/03). Exit 11A departs from I-140 east for U.S. 129 south. The US highway travels four miles into Alcoa and six miles to the Blount County seat of Marysville. Photo taken by Chris Patriarca (03/22/03). U.S. 129 concludes eight miles north from Exit 11B at Interstate 40 in Knoxville. Photo taken by Chris Patriarca (03/22/03). An end shield for Interstate 140 stands ahead of the entrance ramp from U.S. 129 north to SR 162 east. SR 162 extends the freeway south another 2.5 miles to SR 33 (Old Knoxville Highway). Photo taken 08/23/03. SR 162 leads northwest west from SR 33 by the town of Rockford to become Interstate 140 at Exit 11 with U.S. 129. Photo taken by Chris Patriarca (07/12/03). Exit 11A follows for U.S. 129 south to Alcoa as Interstate 140 travels north to SR 333 and the Tennessee River bridge. Photo taken 08/23/03. U.S. 129 northbound at the loop ramp for Interstate 140 west. Photo taken by Chris Patriarca (07/12/03). U.S. 129 south reaches the westbound on-ramp for Interstate 140 toward Oak Ridge. Photo taken by Chris Patriarca (07/12/03). The last mainline interchange along I-140 connects with U.S. 11/70 (Kingston Pike). The commercial arterial parallels I-40/75 west to the town of Farragut and east to West Town Mall in Knoxville. Photo taken 11/08/09. I-40 east & I-75 north overlap 8.7 miles east from Interstate 140 into Knoxville. The two separate at Marble City ahead of Downtown. Photo taken 11/08/09. Crossing over Parkside Drive, I-140 enters the three quarter cloverleaf interchange with I-40/75. Photo taken 11/08/09. Interstate 140 concludes just past Exit 1D to Interstate 40 west to Nashville and Interstate 75 south to Chattanooga. Pellissippi Parkway extends north along SR 162 on a controlled access expressway to Solway and SR 62. Photo taken 11/08/09. SR 162 southbound transitions into Interstate 140 east one half mile ahead of the exchange with I-40/75. Photo taken by Chris Patriarca (03/22/03). The first confirming marker for I-140 stands beyond the Dutchtown Road entrance ramp to SR 162. Photo taken by Chris Patriarca (03/22/03). Two lanes separate from Interstate 140 east for I-40/75. SR 162 emerges from I-140 in 12.2 miles along Pellissippi Parkway in Acloa. Photo taken by Chris Patriarca (03/22/03). Interstate 40 and 75 combine for 17 miles between Eaton Crossroad and I-640 in Knoxville. Photo taken by Chris Patriarca (03/22/03). 0.75 miles ahead of the cloverleaf interchange (Exit 376) for Interstate 140 and SR 162. Photo taken by Chris Patriarca (03/22/03). A distributor roadway takes motorists from I-40/75 east to Exit 376A for SR 162 north toward Oak Ridge and Exit 376B for I-140 east toward Maryville. Photo taken by Chris Patriarca (03/22/03). Interstate 140 (Pellissippi Parkway) heads eastward between a number of subdivisions from SR 162 and I-40/75 east of Concord along western reaches of Knoxville. Photo taken by Chris Patriarca (03/22/03). 0.75 miles ahead of the collector distributor roadway (Exit 376) for Interstate 140 and SR 162. Photo taken by Chris Patriarca (03/22/03). Exit 376 separates from the I-40/75 westbound mainline for SR 162 north toward Oak Ridge and I-140 east toward Maryville. Photo taken by Chris Patriarca (03/22/03). I-40 west and I-75 south continue with four lanes through the exchange with I-140 and SR 162. Interstate 75 travels 91 miles southwest to I-24 at Chattanooga. I-40 combines with I-24 west through Nashville in 163 miles. Photo taken by Jeff Morrison (08/12/05). Traffic partitions with a two-lane ramp (Exit 376A) for SR 162 north. SR 162 travels 5.8 miles northwest to SR 62 by Melton Hill Lake. Photo taken by Chris Patriarca (03/22/03). A loop ramp joins the c/d roadway along I-40/75 west from I-140 west. Exit 367B follows for I-140 east to Alcoa and Maryville. Photo taken by Chris Patriarca (03/22/03). The original one mile sign for I-140 east (Exit 376B) along I-40/75 west. Vidcap taken 08/08/99. Late 1990s construction expanded Interstates 40 and 75 southwest from Knoxville. Exits 376B/A were relocated to a c/d roadway during the project. Photo taken by Chris Saylor (03/99). “Traffic Travels Over New Part of Pellissippi more than 1,500 Cars an Hour Figured.” Knoxville News Sentinel, December 5, 1992. “Pellissippi Parkway Extension Eventuallly will Link three ET Counties.” Knoxville News-Sentinel, October 28, 1990. “New Portion of Pellissippi Parkway Opens.” Knoxville News-Sentinel, October 7, 1993. “Pellissippi Parkway Link Opens.” Knoxville News-Sentinel, December 18, 1996. “Alcoa Highway TO Cusick Road Stretch Opens.” Knoxville News-Sentinel, December 22, 1996. “Pellissippi extension to open.” Daily Times, The (Maryville, TN), August 9, 2005. “Alcoa backs Pellissippi Extension Alternate A.” Daily Times, The (Maryville, TN), October 12, 2011. "’Missing Link’ to open 52 years after construction began on Foothills Parkway." WBIR (Knoxville, TN), October 25, 2018. “Federal Highway Administration approves route for Pellissippi Parkway Extension.” The Daily Times (Maryville, TN), September 12, 2017.